Yangdak Heruka (Tib. ཡང་དག་ཧེ་རུ་ཀ་, Wyl. yang dag he ru ka), Vishuddha Heruka or Shri Heruka (Skt. Viśuddhaheruka, or Śrī Heruka) is one of the eight deities of Kagyé, corresponding to the Enlightened Mind. 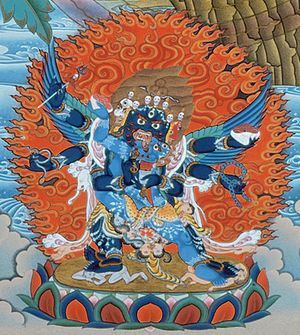 Yangdak Heruka is wrathful manifestation of Vajrasattva and is similar to the deity known as Chakrasamvara (Skt. cakrasaṃvara; Tib. Demchok, Wyl. bde mchog), practised in the Sarma tradition. All the deities of the Mother Tantras are said to be included in the practice of Yangdak. Yangdak Heruka was the main yidam deity of the Vidyadhara Humkara and his Tibetan disciple Namkhé Nyingpo. The instructions related to Yangdak are based on the so-called "eight syllables of the rulu mantra". In the Longchen Nyingtik, the Yangdak practice related to Palchen Düpa is called "Union Of The Buddhas" (Wyl. yang dag sangs rgyas mnyam sbyor). Yangdak Heruka is often translated back into Sanskrit as Vishuddha Heruka. The Sanskrit term Vishuddha means pure and is usually rendered by Tibetans as Namdak (Wyl. rnam dag). The Tibetan term Yangdak, however in Sanskrit usually translates: a) an upsarga like sam, b) an adverb like samyak (Eng. perfect, total, complete), or c) an adjective or an epithet, such as shri. Humkara wrote three sadhanas preserved in the Tibetan Tengyur dedicated to Shri Heruka (D 1674, D 1675 & D 1678). One of these sadhanas (D 1678) was translated into Tibetan by Namkhé Nyingpo. The title of this sadhana contains Yangdak, and it is dedicated to Shri Heruka (Wyl. dpal khrag 'thung). Although this may not be a conclusive argument, it suggests that the name of Yangdak Heruka in Sanskrit is Shri Heruka. Another possibility, which may speak in favour of Vishuddha Heruka is that Shri means glorious and is an epithet used for many deities. This would imply that the deity is simply referred to as Glorious Heruka, while its actual name is different. Jamgön Kongtrul Lodrö Tayé, The Treasury of Knowledge: Systems of Buddhist Tantra, Ithaca: Snow Lion, 2005. Lo Bue, E. “The Role of Newar Scholars in Transmitting the Indian Buddhist Heritage to Tibet.” In Les habitants du toit du monde. Hommage ά Alexander W. Macdonald, ed. Karmay, et Sagant. Nanterre: Société d’ ethnologie, 1997: 629 - 658.